Go Out and Play! Here, at your fingertips, are how-to's for more than seventy best-loved games, all set to spread the fun of active play to kids of all ages. This lively, infectious guide to games runs the gamut from classic to contemporary: freeze tag, blindman’s bluff, red light green light, four square, duck duck goose, and so many more. It’s all sparked by KaBOOM!, a nonprofit with a passion for creating outdoor play spaces nationally and around the world. Darrell Hammond, founder and CEO of KaBoom believes that outdoor play is disappearing from our children's lives. Too few places to play, too much television and video game playing, and unsafe neighborhoods are just a few of the reasons this is happening.With the help of Playworks this book was written. 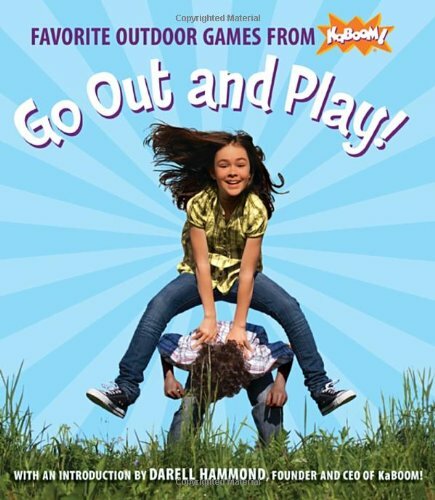 It has over 95 pages of all kinds of games to play outside. Some of the chapters include: tag games, hide and seek games, team and ball games, and sidewalk games to name just a few. One easy to play tag game was called "pickpocket tag". Each child has a strip of fabric in his/her back pocket or waistband, sticking out. The children chase each other trying to retrieve the fabric strip. Whoever has the most strips wins. I liked this game because everyone plays until the end of the game. "Snail" is similar to hopscotch, but uses a drawing of a snail as the pathway. Why not set up an obstacle course? The book has many ideas for obstacles. This is a wonderful resource for any adult and with summer vacation it is timely too.I recommend this book if you are searching for activities your children can do outdoors.